theVancouver, B.C., April 10, 2019 - Adamera Minerals Corp. (TSX V: ADZ; OTC: DDNFF) outlines its key exploration targets on the Goodfoot property located along the Lamefoot Trend within the Cooke Mountain project in Washington State. Situated 2 kilometres to the south along strike of the former Lamefoot Mine, the Goodfoot property has progressed from data collection and interpretation to drill target selection. 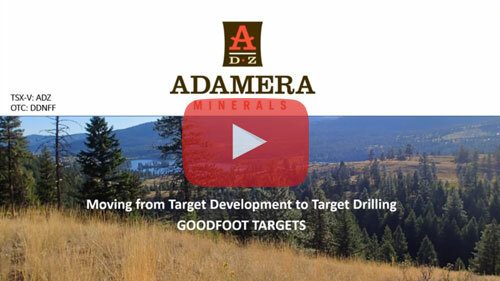 Adamera is preparing for an extensive drill program on this and other properties and provides this video to demonstrate the Goodfoot targets. Adamera's Good foot property is located along what is believed to be a southern extension of the Info Fault approximately 2 kilometres to the south of the Lamefoot Mine. The targets developed on the Goodfoot property are the result of several modern surveys including geophysical, geological and geochemical techniques. Magnetic and electromagnetic anomalies with strong gold in soil support the presence of gold in massive magnetite/sulfide targets. IP anomalies with strong gold in soil anomalies potentially represent gold in vein stockwork targets. Significant gold values in soil associated with the targets range from 0.1g/t -1g/t gold. Interpretation of recent detailed geological mapping by Adamera incorporates structural, geophysical and geochemical data to provide better geological control and exploration targeting. This has resulted in the identification of more than 5 kilometres of prospective limestone – clastic contact along strike of the Anfo Fault. Numerous shallow targets defined by coincident magnetic, EM, IP and or soil geochemical anomalies have been identified along this stratigraphic and structural horizon.